Maases of double-flowered pompoms will take your gardening upwards! Give your neighbours something to really talk about! A guaranteed head-turner whenever it blooms. 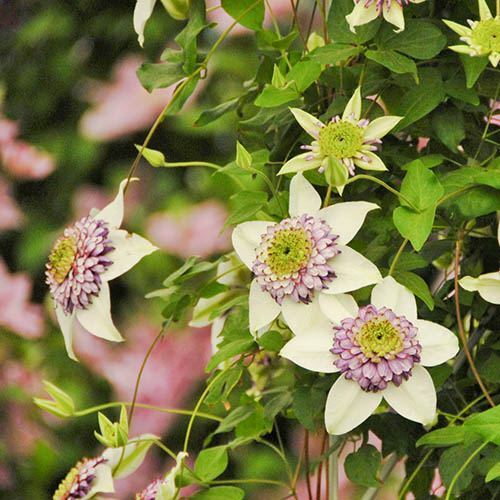 A garden-worthy introduction from world-leading clematis breeder Raymond Evison. Clematis 'Vienetta' produces masses of double creamy flowers with a striking pompom of purple inner petals. Bred to be ideal for growing in a container. Supplied as an established plant in a 2L pot, ready to be planted straight out. 'Vienetta' has got to be one of the most stunning and remarkable clematis varieties and a guaranteed head turner whenever it is in flower. Preferring a sheltered part of the garden so that the flowers are not disturbed by cold winds, the relatively compact nature of 'Vienetta' makes it ideal for growing in a container. When planted in the garden, it makes a real feature when grown through evergreen shrubs, which will also provide protection from winter cold. 'Vienetta' flowers in late summer on the current year’s growth, so pruning should be carried out in spring when the plant is dormant. Simply cut back all of the previous year’s stems to a pair of healthy buds around 20cm (8in) above ground level.